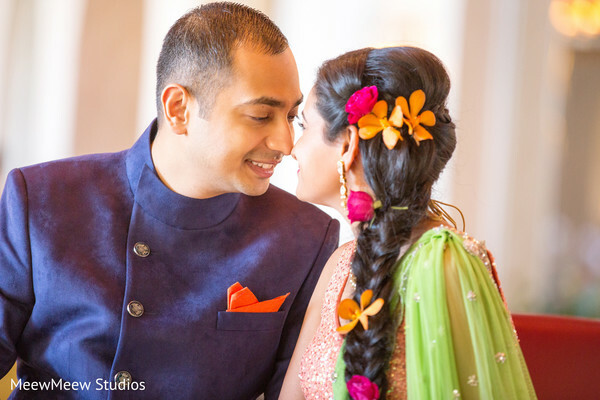 MeewMeew Studios captured all the excitement of Punita and Rutvij’s wedding weekend in the warm ambiance of Hawaii. 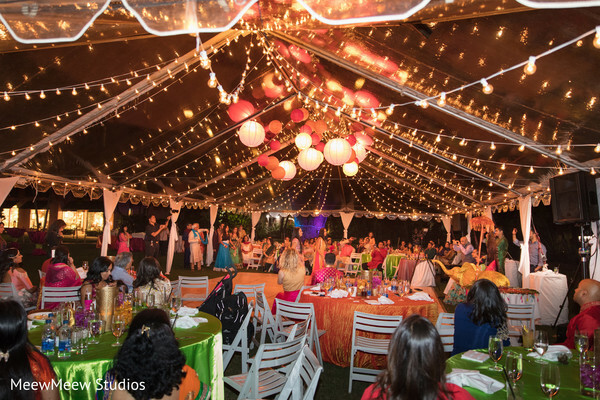 The sandy shores of this charm tropical scenery were the perfect destination for this New York couple who said Aloha to all their guests in a gorgeous welcome party in the best Hawaiian style. 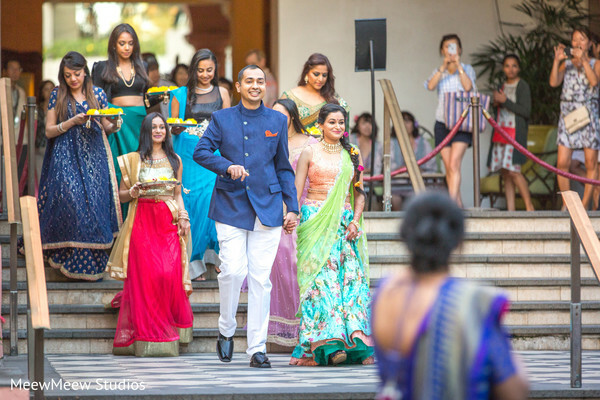 Following the first night in paradise and to comply with the tradition, the couple held an outdoor Sangeet night that combined traditional Indian dances with a fantastic performance of Hawaiian fire dancers. Our gorgeous Maharani Punita looked stunning for her sangeet in a floral lehenga that Style By Susmita combined with a beautiful braid festooned with natural flowers. 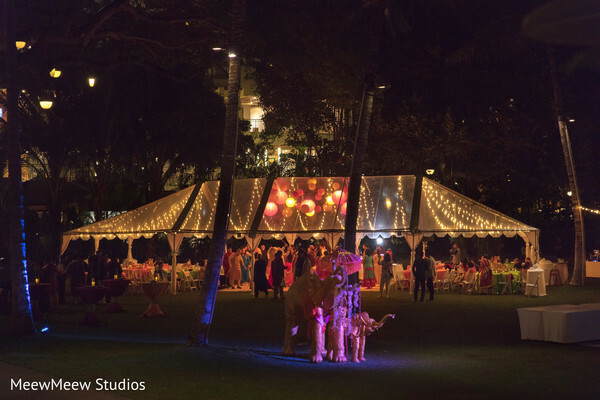 Mira Savara Events helped this cute pair plan and design all their magnificent events at the best resort of the island, The Royal Hawaiian. 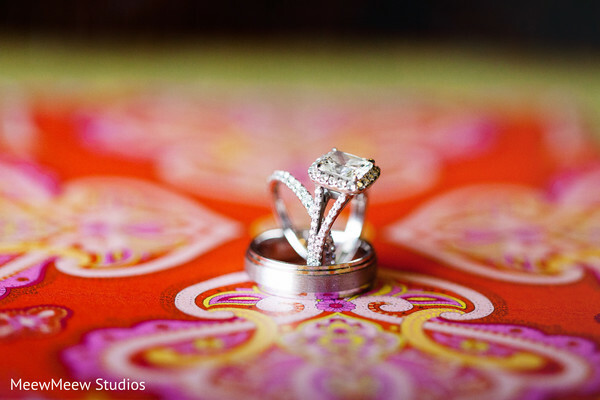 See the beginning of this tropical destination wedding in our full gallery! I met him through a little known app called Coffee Meets Bagel. We had a lot in common and clicked immediately. I knew he was the one, because as simple as it may seem, everything was easy between us - the laughter, the smiles and just being with him. One of things that is on my NYC bucketlist is to have a picnic at Central Park. We tried that year, but unfortunately we could not make it happen. So instead Rutvij surprised me with a gorgeous indoor picnic (literally pinterest worthy) and then took me to a bar where all our nearest and dearest were. It was definitely one of the best nights of my life. The decision to have our wedding in Hawaii was a very personal one. A few years ago, I lost my mother. One of the last conversations I shared with her, we talked about my to-be wedding day and she told me to have a small destination wedding in Hawaii. I never thought we would actually end up doing our wedding here, but ultimately it seemed to in the end make the most perfect sense. I was very happy to honor her memory. My wedding planner Mira was phenomenal and really helped us throughout the process. My wedding went so smoothly because of her, and I am so grateful for that. Hair and makeup was a bit difficult for me, and I had several trials in Hawaii. 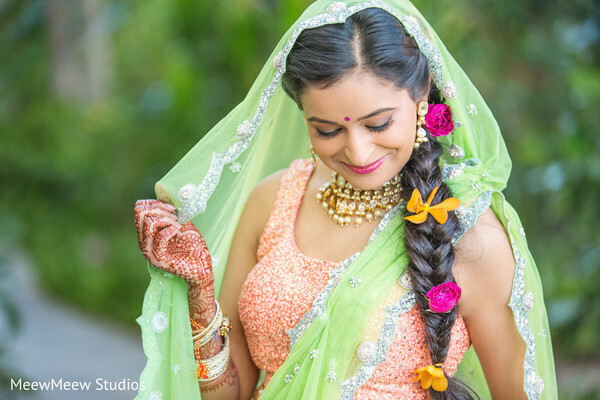 In the end, I wanted someone I could trust, and had worked with Indian brides before. 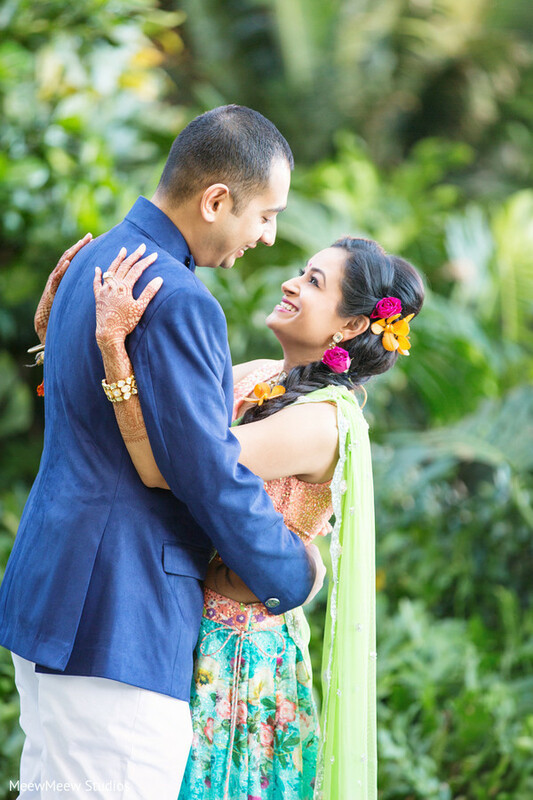 From my friends, I found Susmita and ultimately I'm so glad I hired her because the one thing I never stressed about during my wedding events was my hair and makeup. She was always on top of it. I researched a great deal to determine what outfits I wanted. I had the general theme for each outfit in mind, the hard part was finding it. I tried looking locally without success, so took a week to do my wedding shopping in India. It was probably the most stressful part of this entire process, but in the end it all worked out. Because it was a destination wedding, it was very important to me that that my guests have a great time. This included music with a great DJ, a great atmosphere and obviously delicious food as well as drinks. My decor themes were already decided ahead of time (with a little help with pinterest). 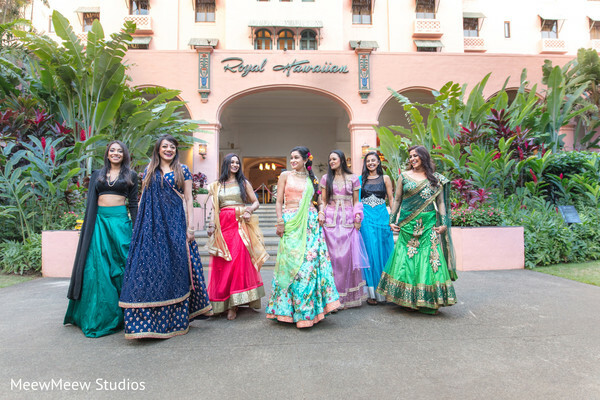 I wanted the welcome party to be a Hawaiian-esque, the sangeet to be filled of color, as an ode to my culture and the wedding to be filled of soft peach and pink colors to backdrop the ocean and my reception was purple, turquoise and gold - peacock colors essentially. I had the color peach in mind. I really wanted to move away from traditional red. It is a destination wedding after all and I envisioned that color to look really beautiful in an outdoor wedding. I tried on many, many dresses. It was a back and forth, but my mind always came back to this dress. I really enjoyed every part of the planning process to be honest. It was really a labor of love, because this was not only a celebration of two people in love but two families coming together. I think the best part I would say as stressful as it was, was going wedding shopping in India. It was very chaotic, but I did it with my now mother-in-law and we really bonded through the experience. A lot of my guests appreciated how well planned and organized our wedding was. I was told by multiple people how this was one of the best planned weddings they went to. Our wedding was in Honolulu which is very busy and touristy. It wasn't until our wedding morning that we were able to escape for a short time together to take pictures by the water. I remember how terrified I was, but standing on top of rocks near the water holding the hand of the man I love felt pretty incredible. 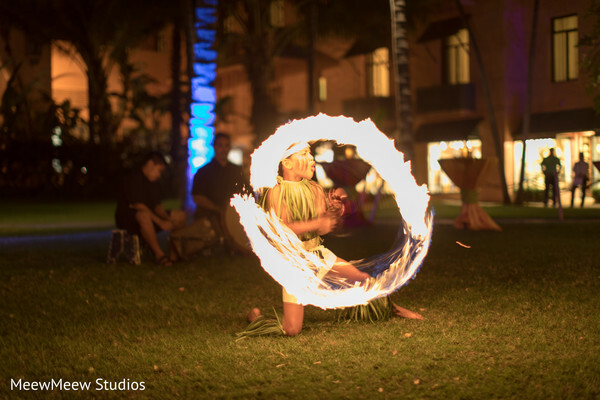 Because we were in Hawaii we wanted to make sure we included some elements of Hawaii in each of our events. Our Welcome Party was an ode to Hawaii, so we had fresh pineapples adorned on all the tables. Because our wedding was small, it was important for my guests to feel special and feel intimate. Both my husband and I greeted guests with leis as they walked in. We also had a hula dance performance. 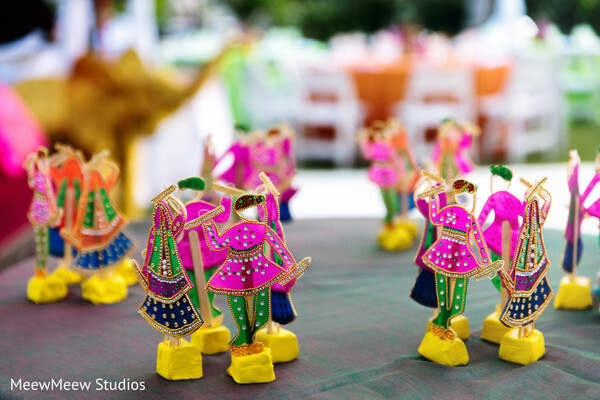 For our sangeet, we really wanted it to feel like a festival of song and dance. We started off surprising the guests with Hawaiian fire dancers, which were amazing. Then family and friends performed dances and we capped off the night with garba and raas. Our cocktail hour had a Hawaiian ukuele player, and was outdoors overlooking Diamond Head. I love to dance but my husband is a bit dance-shy. However, for our wedding he agreed to take dance classes with me. For 3 months we practiced a ballroom dancing and salsa routine to perform as our first dance. It was definitely challenging, but I am so glad we were able to do it. First and foremost, stay organized and rally in as much support as you can. Do your research with vendors, ask necessary questions and perhaps talk to others who have hired them to get an idea. It is definitely stressful, and easy to get lost in the details. In those moments, remember what your wedding really is about: you and your significant other. Get ready for the most charming ceremony images at the dreamy beaches of Honolulu! Mira Savara Events and The Royal Hawaiian, a Luxury Collection Resort are members of the Platinum Guide. Love what you see? Explore their portfolios.